Showcased above is a rather unique hardcopy. It represents an early incarnation of Kalibak. This version harnesses the Jack Kirby style much better than the released version from my perspective. Interestingly this conceptual Kalibak's color and costume style match very closely to one Kalibak image found on conceptual art for the Kalibak boulder bomber vehicle. 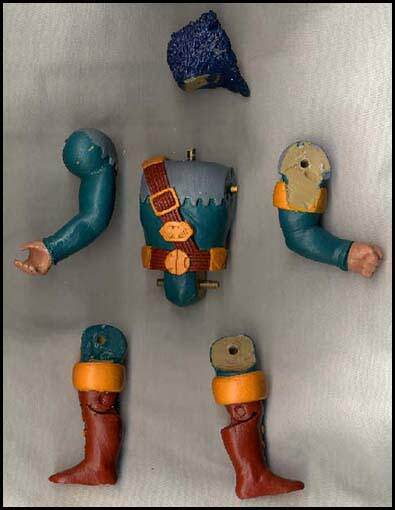 The costume details found on this preliminary hardcopy were obviously incorporated into the final figure design to some extent. 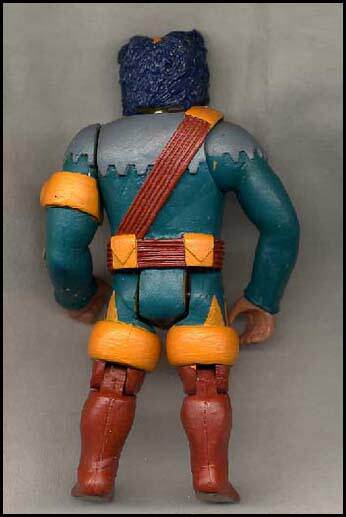 Kalibak is entirely handpainted and cast in a brown colored resin referred to as carbalon. Carbalon, an earlier resin utilized by Kenner, shows up on Super Powers hardcopies in very few instances. 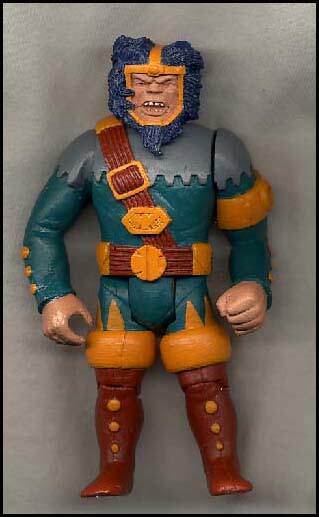 It is quite possible this hardcopy was crafted and painted as an early presentation item by Kenner to DC Comics, although that is purely speculation on my part. Above we see a view of the hardcopy in its disassembled state. Notice the head and limbs attach to the torso via small dowels. These dowels are typically steel, like the ones found on this hardcopy, although plastic dowels were occasionally employed as well. Sometimes the limbs of hardcopies are glued in place. Regardless, potential for disassembly, resin material, lack of foot holes/copyright information represent characteristics found on all hardcopies. The hand craftsmanship and potential to disassemble hardcopies make them one of the premier prototype stages to collectors.